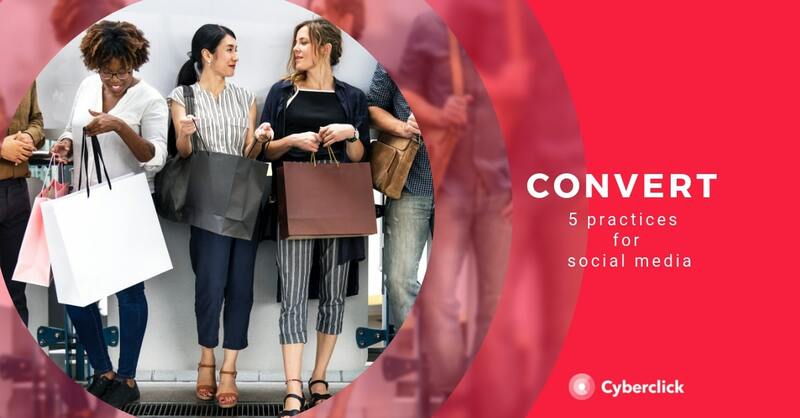 Social media marketing has been around for quite a while, but not all companies know the best practices to take advantage of its full potential. How do we get from social media engagement to improved sales results? It involves knowing how to design a plan and implement techniques to increase conversion rates on social media. Social media marketing groups different strategies to promote a company or brand on online environments including the social networks you know as Facebook, Twitter, Instagram, etc. Defining objectives of your company’s online presence. It’s useful to keep the SMART acronym in mind: Specific, Measurable, Attainable, Realistic and Time-bound. Defining KPIs to measure for evaluating results. If you want to find out how many kilometers are left to arrive at your destination, it would be foolish to look at a compass. A clear definition of social media KPI metrics ensure you are measuring what really matters. A communication plan. Don’t be on social media just for the sake of being there - make sure to be sending a message that will interest your potential audience. An action plan / campaign that details every step you will take to reach your goals, in various different phases. Remember to be realistic with your deadlines or you’ll find yourself in trouble further on. An online reputation crisis plan. Even the best of brands can find themselves in an unexpected crisis caused by an angry customer or a miscommunication. A fundamental practice at the basis of a solid social media plan is that it must be flexible and adaptable. The most defining characteristic of social networks is the interaction that exists between users, and this is unpredictable by nature. Now that we are clear on planning marketing practices on social media, the next question is how can we convert more with our campaigns? In that sense, here are 5 practices to improve your results. The mobile age is already upon us: according to Google, mobile traffic overtook that of desktop worldwide in 2015. As our internet consumption behaviors change, our formats and campaigns have to adapt. Make the most of the mobile features on various platforms that natively integrate videos into your user’s daily stream. Integrate call-to-actions into video content to draw the user to your site. Foster customer loyalty and convert more by creating your own branded ‘TV channel’. With the rise of ad blockers, marketers are realizing the importance of native ads. Users are fed up with intrusive advertising and show it by blocking them on their desktops and mobile devices. The answer is not to continue forcing ads on people who are not interested, but instead invest in creating advertising that truly brings adds value. Native advertising cannot be easily blocked because it is not something external to the content itself - it is an integral part of it. Instead of creating ads, offer your users articles that they are truly interested in, and videos that can help solve their problems. Make them want to actively search for your content instead of running away from it. Purchase buttons integrate ecommerce into social media, making it possible to purchase without ever leaving the platform. The advantages for brands are very clear: the simpler and more direct the purchasing process, smaller are the chances of the user abandoning it. This is a great way to make the most of this trend and combine it with your best lines of text to optimize your results. It’s not only about what you say, but who you say it to. The beauty of micro segmentation is the message-audience fit. Discovering our audiences allows us to give them what they need. Combining this knowledge with the latest trends of applying artificial intelligence to ads, we can take customization to its extreme by creating campaigns for very small and specific targets, segmented by the pages they follow, their hobbies, the destinations they choose for their holidays, the brands they interact with, etc. Influencers have been trending for years now and they still have a lot to offer us, on YouTube as well as on blogs, social networks and other channels.Search for profiles that will really be able to “move” your target audience and collaborate with them intelligently: don’t just pay for product reviews! Influencers can help you go significantly far, give credibility to your brand, obtain user generated content, virality and, most importantly, give a human touch to your company. Social mediums are making conversion tools ever more accessible for marketers. For those who use Social Ads: various social medias are updating their tools, which provide information in detail on the real effect of ads on social media. By segmenting the audience in groups of test and control to make comparisons between them, you can accurately measure the effects of your advertising. This potentiates our budget, enabling investment in ad campaigns that are most effective. With integrated social media tools, it is possible, for example, to compare the conversion rates on the web for users who have seen our ads and those who have not been exposed to them, so you can set up different campaigns competing for the same purpose too see which gets better results. Various social media tools have similarities and differences in the metrics that are measurable and analyzed. By comparing results and performance from the various tools in a coordinated manner, you get to make the most out of your advertising dollar. Keep in mind that you need a certain amount of traffic to see relevant results. Once you receive your reports from social media sites, it's your turn: what can you learn from the results for your next campaign? With these tool, you can become an increasingly effective advertiser.